In 1989, a Long Island contractor decided to buy the contents of a storage container. He paid under $100 and he didn't know what was inside. But the next day, when he and his brother opened up the container, they saw a giant lump covered in blankets. When they pulled off the blankets, they saw a white sports car with no wheels and a dented roof. It was the famous James Bond submarine car from "The Spy Who Loved Me." "They really didn't know what it was at first," said Doug Redenius, co-founder of the Ian Fleming Foundation, which authenticated the car. "They had no idea how valuable their discovery was." Now, 36 years after the car made its big screen debut, 007's underwater Lotus Esprit is headed to the auction block. The owner, who bought it for less than $100, could fetch more than $1 million. It is being sold by RM Auctions at its London sale on Sept. 9. "It's one of the most famous James Bond cars ever," Renedius said. "There is a lot of interest." Plenty of James Bond cars have come on the market over the years, seeking to ride the boom in collectible cars as well as soaring prices for movie cars. A coveted 1964 Aston Martin DB5 that was used in "Goldfinger" and other films and that sold in 2010 for $4.6 million. A DB5 that was used to promote the films is also currently on the market for $4.69 million. 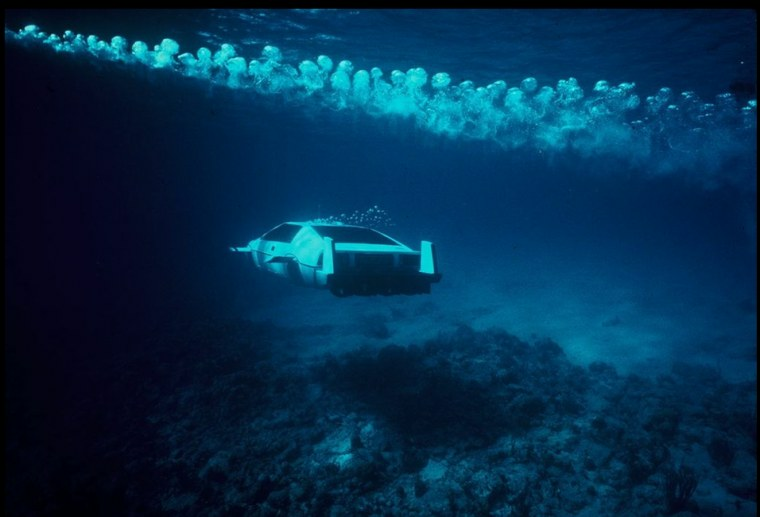 Next to the Aston Martin, however, the submarine car—nicknamed "Wet Nelly" during the filming—is widely considered to be the most famous Bond ride. The car helped Roger Moore and actress Barbara Bach escape a marauding helicopter by jumping off a pier and turning into a submarine. Renedius, who is also marketing director of the Economic Alliance of Kankakee County in Illinois, said that eight different versions of the Lotus Esprit were actually used in "The Spy Who Loved Me." At least two cars were used for the chase and pier jump. Three other cars were used for the underwater shots—one version was used for the retracting wheels shot, another used for the fins popping out, and a third used for the traveling submarine shots. It is the third car—which is not functional as a road car—that is being sold by RM Auctions. The actual owner of the car prefers to remain anonymous. But Redenius said the owner is a "blue collar guy" who has a business that rents construction tools and makes a "very modest" living. The sale, Redenius said, is likely to change the seller's fortunes. "I told him, I said 'Come September 9th, be prepared for your life and your wife and your children—your life is going to change dramatically. And he said 'well, how so' and I said 'First of all, you're going to go down in history as the guy who found the James Bond car. But then if it sells for what we're hoping, that money will give you an opportunity to live very comfortably for the rest of your life.'" According to Redenius, when the owner first discovered the car, he didn't realize it was a Bond car since "he had never seen a James Bond movie." When he loaded the car onto his truck and started driving home, other truckers noticed the car and told him over the CB radio that he had the famous Lotus. The owner then "went out and rented the movie on VHS and saw what he had." Years later, Redenius had heard rumors about the car's existence and searched out the owner. He then had the car verified by the original builder—a former Navy SEAL and submersibles expert in Florida—and connected the seller to RM Auctions. Redenius said the other Lotus cars used in the movie are either in museums or have fallen into disrepair. It's unclear how the car ended up in storage in Long Island, he said. The car was used for promoting the movie in 1977, and was in paid storage for 10 years after that. But somehow, the owner of the storage facility—perhaps the Hollywood studio or production company—stopped paying the storage fee. "It just fell through the cracks," he said.